5.0 kg. , 11.0 lbs. Pillar Beach is a lonely cove situated on Kodiak Island, Alaska. In the last few weeks, there had been a strong return of Coho Salmon to the stream that enters the ocean there. That salmon run brought in many rod-and-reel fishermen to fish the beach. 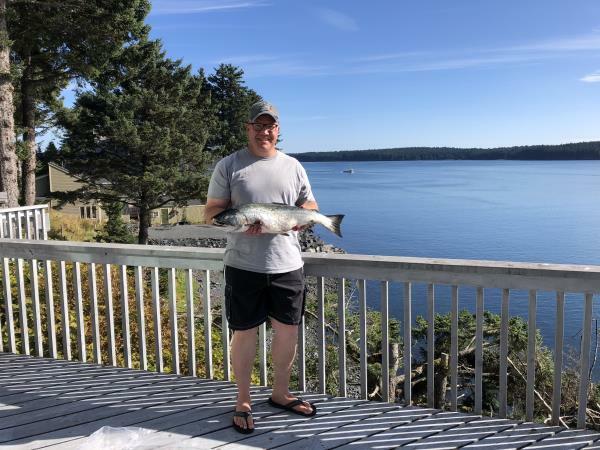 However, in recent days, the salmon run had tapered off and the rod-and-reel guys had gone elsewhere looking for more fish. I decided to dive Pillar Beach in order to avoid those crowds. It was a sunny, calm day and there weren't many signs of fish. Visibility was about 10 to 12 feet. After searching for over an hour, I still hadn't seen any fish. I decided to crossover to the south side of the cove to see if there were any fish hiding in the darker water in the shadow of the cliff which forms the south side of the cove. After another half hour or so, I still hadn't found any fish. I decided to call it a day. While swimming back to the beach side of the cove, I found myself surrounded by a great cloud of sediment that had been stirred up by the current. In this cloudy, shadowy water, I could barely see the end of my spear gun. Then suddenly, I saw a large tail whip around in front of my gun. It was a Coho who hadn't seen me coming! I turned and pulled the trigger as quick as I could and caught him right behind the gill plate. As he thrashed about he gave my gear a good tangle. Finally I was able to dispatch him and make it back to the beach.